Britta Olmann in Theater Latté Da’s production of Once. Photo by Dan Norman. 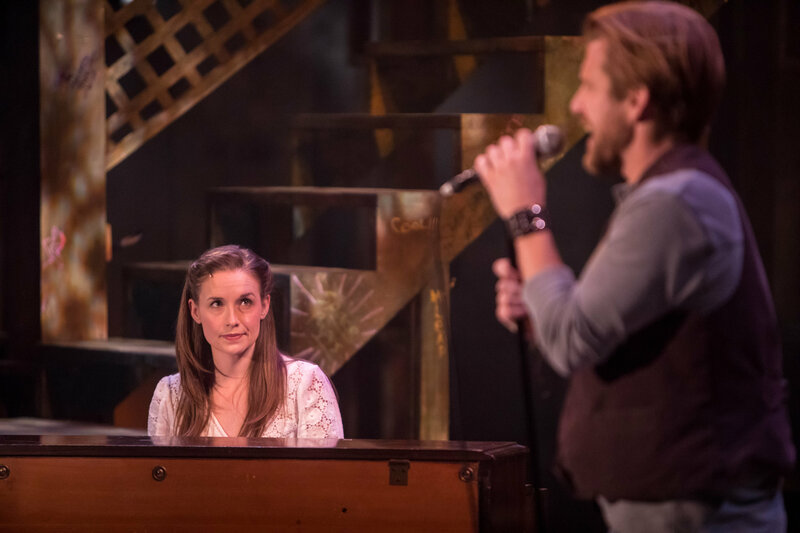 Once, I saw a play that was a romantic story about a Girl and Guy who make an unlikely couple connected by a love for music. 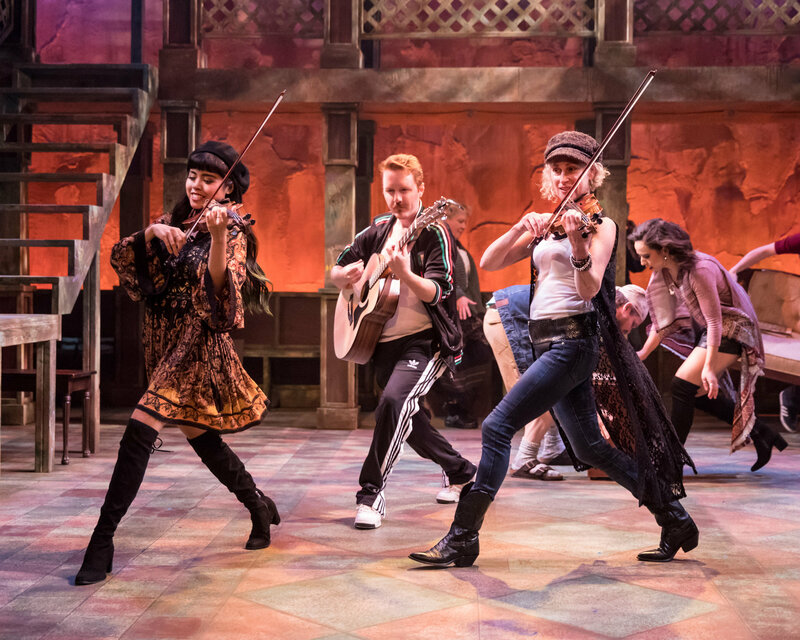 The production was full of songs with folksy melodies played on guitar and a cross-cultural musicology of old Irish folk tunes, with dancing fiddlers. The play was Theatre Latté Da’s current offering, Once, adapted from the movie by Enda Walsh with songs by Glen Howard and Markéta Irglová. Before the show started, the stage at the Ritz Theatre auditorium was taken over by an ensemble of what seemed to be eight Irish musicians playing foot-stomping drinking songs and sentimental airs. When the main characters entered, the play began and the ensemble of musicians moved upstage, but didn’t exit. They hung around, acting as a musical chorus that chimed in during songs, provided some dancing, and with certain individuals stepping out to play secondary roles. Jay Albright, who played the accordion in the ensemble, also played the Dublin banker with a welcome dollop of comedy. The ensemble of Once. Photo by Dan Norman. The story is the product of the EU’s open borders policy as a young woman (the Girl) played by Britta Ollmann meets a young Irishman (the Guy) played by Ben Bakken. on a street of Dublin. She is an immigrant from Czechoslovakia, a displaced person who comes from a family with a musical heritage. The Girl’s heart breaks when she sees the Guy walk away from the guitar he had been playing on the street for tips. She calls after him not to abandon his dream of being a musical artist. He’s cautious at first, but she follows through on her promise to help him record a demo album. All through the scenes leading to the recording session for the album, the Guy plays his angst-filled songs as only a soul-baring singer-songwriter can. The play comes to a powerful introspective pause, however, when the Girl plays a ethereal composition of her own on piano, thinking that no one is around. However, the Guy does hear her song and becomes filled with guilt and second-guessing when his demo is successful, leading him away. Britta Ollmann bring an amazing voice that is rich, resonant, and filled with emotion to her performance. Ben Bakken is much less interesting as a singer, with a thinner voice that doesn’t really rise to emotional intensity, his strumming up a storm notwithstanding. This is important because it requires some suspension of disbelief when his character is being enthusiastically applauded by everyone on stage; given the centrality of the demo to the narrative, it seems a piece of miscasting. Britta Olmann (Girl) and Ben Bakken (Guy) in Theater Latté Da’s production of Once. Photo by Dan Norman. Scenic designer Michael Hoover and lighting designer Grant E. Merges’s work includes a clever innovation during a particularly intimate conversation between the main characters. Incandescent, yellow-orange lights are lowered from above the set to different levels above the stage, creating a galactic-style lighting display. The singer-songwriter meme that drives the story of Once seems a bit dated and comes off a little awkward. At times, it is difficult to integrate the performance of a song with the flow of the play. Often, all action comes to a stop, as all the characters on stage stop and listen to the singer. The self-contained songs also seem to relate only slightly with the theme of the play. Theatre Latté Da’s production of Once is a romantic story of star-crossed lovers and dreams yet to be fulfilled. Despite its flaws, it’s still very enjoyable and a great introduction to Irish folk music. Once plays at the Ritz Theater Mainstage in Northeast Minneapolis through October 21.